There are plenty of information resources available to cancer patients. Treatment options are well described online via authorities such as the National Cancer Institute and leading cancer treatment hospitals. Offline support can be accessed via patient associations, patient navigators and a patient’s cancer care team comprising of oncologists and allied health care professionals. However, shared decision making with an oncologist is often the best form of support for patients and their caregivers. This decision making is characterized by disproportional expertise resting with the oncologists and not enough time at their disposal to explain all the nuances of a specific treatment plan or research and discuss alternative treatment plans. For complex cases, the best option might often be therapies still in investigation via clinical trials, that involve added research and matching based on the individual’s unique cancer. A report in STAT news by Ellen Miller-Sonnet describes how conversations with cancer patients resulted in themes indicating most patients are not equipped to evaluate the risks and benefits of their treatment plans, nor do they feel like active participants in treatment decisions. The Cancer Treatment Navigator team has been partnering with cancer patients across multiple cancer types and echoes many of the findings described in this news report. We encourage all patients to fully understand their diagnosis, get second opinions and choose cancer care teams that are cognizant of the emotional impact of the disease, the individual’s priorities and how rapidly evolving treatment options such as targeted therapies and immunotherapies could provide benefit over standard of care treatment protocols. Cancer Clinical Trials Are Overly Exclusionary: Is Change On The Horizon? Clinical Trial treatments are often the only hope for some cancer patients with advanced disease or complexities such as two types of cancer. However, strict guidelines for entering a clinical trial defined as “eligibility criteria”, exclude several patients desperately trying to enroll and access drugs that could lead to disease reduction and prolong life. A Washington Post article brings this issue to life by relating the stories of two such patients. Carly Bastiansen with pancreatic cancer, and Allen Lee with lung cancer. They have been rejected from several clinical trials on account of at least one of five eligibility criteria that need revamping; minimum age requirements for trial enrollment, HIV/AIDS status, brain metastases, organ dysfunction and a history of cancer or two concurrent cancer diagnoses. The American society of clinical Oncology (ASCO) and the advocacy group Friends of Cancer Research issued recommendations published in November 2017, for broadening the above five eligibility criteria — minimum age requirements for trial enrollment, HIV/AIDS status, brain metastases, organ dysfunction and a history of cancer or two concurrent cancer diagnoses — that they identified as being most likely to restrict a patient's participation in a trial but least likely to affect their safety. Under those recommendations, the criteria that banned Bastiansen and Lee should be revisited. Cancer Treatment Navigator (CTN) frequently helps Cancer patients navigate the complexities of clinical trial identification and enrollment. We also assist in gaining access to promising new cancer treatments outside of regular clinical trials. This is especially important when patients face a dead end because of overly stringent clinical trial enrollment processes. A re-examination of eligibility criteria is greatly welcomed as a positive step toward helping cancer patients with high unmet needs. CAR T-cell therapies are one of the most promising and publicized immunotherapies, but limited in applicability. Two CAR T-cell immunotherapies approved by the FDA in 2017, Kymriah and Yescarta are limited to patients with specific types of blood cancer and failing prior conventional therapies. They are both designed for blocking a specific molecular target on cancer cells, either leukemia or lymphoma known as CD19. However, the CD19 molecule present on cancerous B cells is not the only one enabling them to multiply and grow. Rather, some patients with leukemia or lymphoma do not have CD19 on their cells, so the existing T-cell treatments do not work for them. Other patients, have CD19 at first and go into remission when treated, but then lose the protein and relapse within six months. Researchers at the National Cancer Institute are engineering T cells to target the CD22 molecule (CD22-CAR) that is present on cancerous B cells, either in addition to CD19 or as the main driver of cancerous growth. This experimental therapy, if successful will provide an option to desperately ill leukemia patients who are relapsing on FDA approved CD19-CAR T-cell therapies. Additionally, it opens up the possibility of combination immunotherapy with two types of CAR T-cells administered simultaneously for enhanced results. These important developments are well covered in a New York Times Health article by author Denise Grady. The Cancer Treatment Navigator team supports cancer patients in identifying the latest available treatment options and enabling access to targeted therapies and immunotherapies. Cancer patients often ask us about “Tumor melting T-cells”, described in press releases and news publications that highlight the breakthrough aspect, but often fail to explain the limitations of newly approved treatments. As scientific advisors to cancer patients, we explain nuances of approved immunotherapies and highlight experimental immunotherapies that might be more applicable to their specific cancer. Experimental immunotherapies require careful navigation given multiple clinical research trials running nationwide by hospitals and academic institutions. We encourage patients to leverage scientific research as part of their cancer care approach. Our team aims to emphasize balanced reviews and reports such as the New York Times article referenced above, so patients can be well educated and informed about cancer treatment choices. Cancer challenger, David Dunnington teamed up with Dr. Shailendra Bhatia at the Seattle Cancer Care Alliance (SCCA) toward initiating immunotherapy treatment to curb his cancer when he was running out of options. David had an uncommon Melanoma called acral lentiginous melanoma and his disease had spread after traditional chemotherapy and radiation therapy. David's tumors shrunk after a few doses of an immunotherapy that was in clinical trials at that time. David's key messages about cancer treatment navigation? He shared with Q13Fox reporter MARNI HUGHES that advocating for himself by researching and bringing ideas about treatment options, combined with a team that would listen to him is the key to effective outcomes. The video provides an impactful narrative from David and more details of the story are in the news article. STAT’s investigative journalists establish that cancer treatment navigation is too complex to rely on a computer algorithm whose output is only as good as the information it is fed upfront. 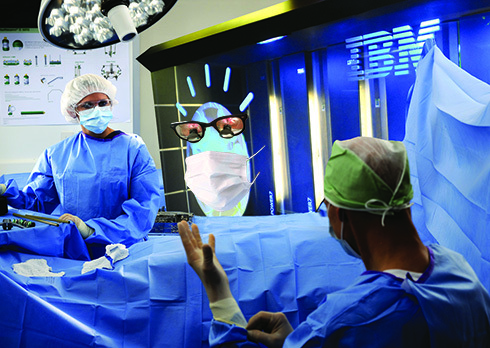 Kudos from our team at Cancer Treatment Navigator (CTN) to CASEY ROSS and IKE SWETLITZ for this unbiased, thoroughly researched report of IBM Watson’s over-promise on revolutionizing cancer care. Clinical Equipoise: Uncertainty over the best treatment option when two are being compared in a clinical trial. The treating physician cannot ensure that a participant gets the “better” of the two treatments. For example, if an investigational drug is compared to an option acknowledged as the standard of care, it might turn out to be better or worse in terms of efficacy, safety or both. Randomization: Treatment allocation is by chance. In the simplest trial design, one group receives the new treatment and is the investigational group. The other group receives standard therapy, and is the control group. At several points during and at the end of the clinical trial, researchers compare the groups to see which treatment is more effective or has fewer side effects. A computer is usually used to assign patients to groups. At Cancer Treatment Navigator (CTN), we explain the nuances of cancer clinical trial methodology so patients can make an informed decision on participation. Understanding the above terms before signing consent is important and could impact a patient’s willingness to withdraw or remain in a clinical trial. The FDA approval for Kymriah (tisagenlecleucel, pronounced tis-a-gen-LEK-loo-sell) is a notable advancement in immunotherapy cancer treatments. Kymriah, a CAR T-cell gene therapy was approved for patients up to 25 years of age with B-cell precursor ALL (B-cell precursor lymphoblastic leukemia is a form of leukemia in which too many B-cell lymphoblasts (immature white blood cells) are found in the blood and bone marrow. It is the most common type of acute lymphoblastic leukemia (ALL). Kymriah is intended for patients whose cancer has not responded to or has returned after initial treatment, which occurs in an estimated 15-20 percent of patients. How it works is that T-cells, a type of white blood cells that are the key players in our immune system, are removed from a patients' blood. They are re-programmed to carry new genetic material and injected back into the patient where they multiply and attack the cancerous leukemia. More details are in the FDA press release. The role patient testimonies played in an important FDA advisory panel, pre-approval meeting is of significance and is reported in this NYT news article. There are now 15+ immunotherapy agents approved by the FDA and 900+ being studied in clinical trials. This creates an enormous amount of information that is difficult to assess, not just for patients, but also their Oncologists. Media buzz around this promising class of cancer treatments further complicates the level of hope that should be maintained by cancer patients regarding their eligibility for the potentially life altering immunotherapy treatments. To solve issues around navigating information and decision-making, Cancer Treatment Navigator (CTN) works closely with a patient’s cancer care team to meticulously research treatments that have not yet been considered for a patient but could provide superior outcomes to existing approaches. Our recommendations are based on clinical science expertise. We compare evidence from publications to the diagnosis, treatment history and specific cancer type of each individual client, resulting in matches that are closely aligned to an individual’s disease and genetic mutation profile. This captures the essence of personalized medicine and makes it tangible for patients. Matching the right patient to the right treatment is the essence of what we do at the Cancer Treatment Navigator (CTN). A Guardian news article captures our approach of evaluating tumors based on site as well as specificity of mutations, and identifying treatments based on individual disease and genetic profile. Several cancers such as breast cancer and prostate cancer are treatable via personalized medicine in clinics and hospitals. But most have personalized medicine available largely in investigational clinical trial protocols. The CTN team considers cancer clinical trials as viable treatment options and researches the full array of approved and experimental therapies on an individual patient basis. This often results in recommending cancer patients treatments, that might not have been considered yet by their Oncologist. Bringing a personalized scientific arm to your cancer care team helps sort the hope from the hype. Colon Cancer survivor Stephanie Joho, provides valuable guidance about appreciating the uniqueness of your cancer, and striving for the best possible treatment options in a Washington Post article. Asking for second opinions, seeking information about genetic testing and exploring clinical trial treatments can alter the outcomes of your cancer prognosis. Your cancer care team should be carefully assembled. In addition to Oncologists, consider professionals who understand the science behind treatments as well as the complexity of the cancer treatment landscape. The Cancer Treatment Navigator (CTN) team are scientific professionals who provide expert navigation of immunotherapy clinical trials among others, based on a patient's medical history and genetic mutation profile. We believe every cancer patient is different and should get individualized treatment plans that are not limited by the only options available as part of standardized treatment protocols. CTN helps cancer patients and their loved ones understand complex cancer biology and treatment options in simple language. We provide each individual patient and their loved ones, the time and attention they deserve. Our personalized services, remain rooted in a thorough understanding of the constraints, difficulties, and emotional experiences of cancer patients. If you or someone you care about has received a cancer diagnosis, please call or email CTN. We facilitate faster access to treatment options beyond standard of care, and our services are nationwide. Cancer Treatment Navigator (CTN) provides expert, personalized services for identifying cancer immunotherapy trials that are closely matched based on extensive review of your cancer’s genetic profile and your medical records. For Advanced Melanoma patients, there is an immunotherapy trial, KEYNOTE-252/ECHO-301, that is important to consider. This is a study investigating the combination of the Immunotherapy Keytruda with Epacadostat (an agent that acts as a different arm of the immune system than Keytruda, and leads to enhanced anti-tumor activity). This combination of two immunotherapy drugs, is expected to bring better results. The study is enrolling patients at more than 120 locations. The CTN team matches cancer patients with the appropriate trial based on their medical & treatment history and works with your Oncologist as part of your personal cancer care team. Rapid advancements in surgical and medical treatment options often lead to overtreating early stage, low risk patients with localized prostate cancer that could benefit from watchful waiting. The Cancer Treatment Navigator (CTN) team provides second opinions about optimal treatment for the patient based on their stage and specific cancer type. CTN also informs about potential side effects that might compromise the patient’s quality of life. Caution toward overtreatment is as much of a concern for us as undertreatment. In support of our ideals, we would like to highlight a recent article in USA today that discusses Treatment Decision Regret Among Long-Term Survivors of Localized Prostate Cancer. This article presents an interesting facet of “patient satisfaction” survey outcomes providing confounding evidence in favor of overtreating. According to patient questionnaires, men with early stage, low-risk prostate cancer, who could have opted for active surveillance or "watchful waiting," appear to be satisfied with the more-aggressive treatments they've chosen. Yet, privately, many men complain to their doctors of persistent side effects such as urinary incontinence and erectile dysfunction following surgery or radiation. Dr. Claus Roehrborn, a professor and chairman of the department of urology at UT Southwestern Medical Center in Dallas says it is important for men making these choices to truly understand what to expect. He suggests, Urologists and other specialists shouldn't rely too heavily on superficial survey results from patient questionnaires, as digging a little deeper might reveal a more conflicted response. Additionally, Dr. Michael Leapman, an assistant professor of urology at Yale School of Medicine in New Haven, Connecticut, warns about marketing pushes for new technology raising patient expectations high. He mentions, 90 percent of prostate surgery performed in the U.S. now is robotic rather than open surgery. Immediate surgical outcomes – less blood loss and shorter hospital stays – appear to be better for robotic-surgery patients. However, the data don't really show improved long-term results in cancer outcomes or sexual function. A new study in the July issue of the Journal of Clinical Oncology tracked long-term survivors of localized prostate cancer for up to 15 years. Men who were monitored but didn't undergo radiation or surgery were less likely to report regret than those who underwent active treatment. CTN works directly with patients and their specialists through the entire process of reviewing medical history, details of diagnosis and identification of the best treatment option. Our personalized services help patients sort through the dilemma of undertreating or overtreating and understand their choices clearly. CTN is not affiliated with any drug development or surgical device company. We leverage our scientific expertise and experience toward unbiased opinions and recommendations for the patient. Glioblastoma’s unfavorable prognosis is largely due to the high possibility of recurrence combined with limited approved treatments. Several clinical trials with new treatment approaches for recurrent glioblastoma are running at a variety of cancer treatment hospitals, academic and government institutions. They offer hope but create a tough landscape to navigate for patients and caregivers. Some therapies are acknowledged more in popular press while shadowing others with hidden potential. To this end, the Cancer Treatment Navigator (CTN) team would like to highlight a novel treatment currently in clinical trials for recurrent glioblastoma. It was brought to our attention via an interview with Dr. Priya Kumthekar, MD and Dr. Alexander Stegh, Ph.D. at Northwestern University Feinberg School of Medicine, published last month in OncoTherapy Network. It is called NU-0129 and is a so-called nano-particle. That means super small. NU-0129’s super small size and shape allows it to successfully reach the site of the tumor in the brain. Once there, it interferes with the cancer cell’s biology and stops its growth which essentially can kill the cancer cells. Researchers at Northwestern University are evaluating this drug for its tolerability and ability to get directly to the brain tumor for maximum effectiveness. On a practical level, rapid advancement in clinical science for cancer treatment has left oncologists strapped for time and resources. Especially when research is required beyond standard hospital protocols for treating most patients. When a clinical trial is considered, very often the clinical trial run by a patient’s hospital ends up being recommended as the best course of action. But that doesn’t mean it is the best choice based on comprehensive research and consideration of all trials running throughout the country. Consequently, one of our main objectives at CTN is to help cancer patients gain access to promising clinical trials based on thorough research and evaluation of published data and compared to the diagnosis, treatment history and specific cancer type of each individual client. Another hurdle that we help overcome is the unnecessarily restrictive eligibility criteria for trial enrollment. Often patients are turned away because many trials only pre-select for very healthy cancer patients to participate. This is done to minimize side effects that might be blamed on the study drug. However, cancer patients are often not healthy, but they still deserve the right to make their own decision about added potential health risks from an experimental medicine. We share the belief with many experts in the field that clinical trials should be for a patient’s welfare and not only for the benefit of a hospital or an individual company’s new blockbuster drug. One of our main objectives at Cancer Treatment Navigator (CTN) is to help cancer patients gain access to clinical trials. This can improve better disease control and subsequently increase the chance of survival. Multiple factors can contribute to a better survival chance for patients who are accepted into a clinical trial - but why do only about 5% of all cancer patients in the US participate in clinical trials? An interview with Dr. Mikkael A. Sekeres at the Cleveland Clinic, published last month in Onco Therapy Network, lists some of the reasons of poor clinical trial enrollment. One of the main reasons is unnecessarily restrictive inclusion criteria. Cancer patients who ran out of “standard of care” treatment options are becoming sick faster, but clinical trials want healthy patients to participate. “Healthy” and “patient” is an oxymoron and contrary to the reality we live in: Cancer patients are sick! They want to be healthy again! Dr. Sekeres does a great job arguing why many trials are too restrictive by not including “real world -sick- patients”. At CTN, we often say that clinical trials are not designed for the welfare of the patients, they are designed for the “welfare” of the drug that is being tested. At CTN we work hard to find solutions for patients who cannot participate in a clinical trial-- for whatever reason. This can be achieved by gaining access to certain experimental therapies that are either still in clinical testing or that are already approved for other indications. Yes, this can be done! Just think about the many immunotherapy clinical trials with so-called “immune checkpoint inhibitors”. Some of these medications are already approved to treat late stage cancer patients for an increasing number of indications. This allows access to these immunotherapies in the “market place” – access for patients with rare cancers that are not included in any clinical trial, or access for patients who won’t meet the restrictive eligibility criteria for some of these life-saving trials.